Random dot patterns are popular to study low level visual perception since dots are reliably processed without attentional bottleneck. Since dots do not require symbolic presentation, they can be applied to pre-clinical research to study the sensoric system of animals, or with pre-school children who cannot read.  When scanning for specific dots among random dots, subjects have to discover some specific dots (signal) among all dots (noise). According to the Signal Detection Theory (SDT) the ability to discriminate between signal and noise is based on the signal-to-noise ratio. There are many different experimental paradigms using random patterns, for example subjects may be asked to discover signal dots, make a forced choice between two patterns, or perform a delayed matching to sample task. Patterns can be stationary or dynamic, stand-alone or side-by-side, and symmetric or not. This experiment is using a forced choice procedure to identify the dot pattern which contains more dots. To study the influence of the signal-to-noise ratio on the response time, the total number of dots (noise) as well as the number of differentiating signal dots are systematically varied.